I did a keynote presentation at GeforceLAN 6 out in Alameda, California, a few weeks ago about the graphics in the PC version of Battlefield 3 and how we have built up all the visuals with tons of individual components. 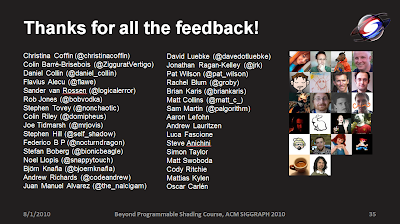 Thanks again to everyone that contributed feedback to my 5 Challenges in Interactive Rendering talk in the Beyond Programmable Shading course! Had a lot of fun discussions and pretty much all of the feedback fit nicely into the selected challenges and topics. Will follow up with some of you that sent long detailed emails of your inner wishes & secrets next week now that I'm back from Siggraph. Here is a list of everyone (I hope!) that directly gave feedback on what the challenges should be or topics of interests, thanks! This is a great list of people to follow on twitter as well. Oh and if you still have thoughts about what the 5 major challenges are and/or didn't have time to discuss it before, please do send a tweet (@repi), post a comment or send an email. Always interesting to discuss & hear people's thoughts and ideas on the topic! 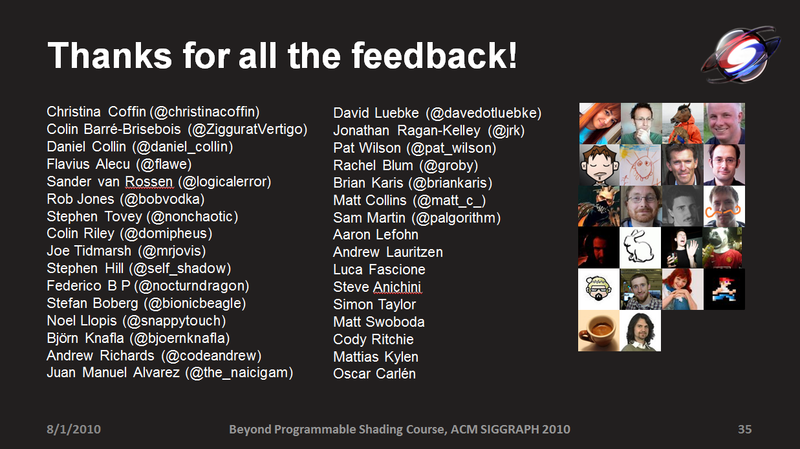 See you, if not sooner, at GDC 2011 (San Francisco) and SIGGRAPH 2011 (Vancouver).